To monitor oil spray on the top and bottom of a continuous feed steel sheet for quality assurance and optimization of oil coating. In addition, to monitor return flow of unused oil to a storage tank to provide total oil used. Steel manufacturers use oil at various stages in the process of making steel. Some examples of specific uses follow: Oil, in combination with water, may be used as a cooling agent to quench steel which has been subjected to intense heat. It may be applied to the surface of steel for rust protection or to prevent scoring in case the steel rubs together. An oil supply monitoring system used in the sheet steel industry should be accurate, repeatable, but above all it must be reliable. Lack of oil on the steel sheets during processing may result in the failure of the processing machinery causing expensive down time or poor quality steel. The flow monitoring system must measure the total spray via multiple lines and the excess oil collected in the sump and returned to storage. A multi-input flow computer is also needed to provide instantaneous rate and total for each line. Three Model MF1/2X50B-.023-.2-B-1M-MS each with ten point NIST traceable calibration. Indicator/Totalizer. Accepts simultaneous inputs from all three mini-flowmeters. The equipment above works as a system in the following process: Channel 1 of the Flowstar will accept the pulse output directly from turbine meter “A” which is to be installed in the sump return line to provide instantaneous rate plus a running total of unused oil which is returned to the storage tank. Channel 2 and 3 of the Flowstar will accept the linearized 4 to 20 mA output signal from the two ACC22B linearizers mounted on the two turbine meters “B” and “C”. Both of these flowmeters supply oil used to coat the steel. The Flowstar 2000 will provide instantaneous rate and total of each line. The Flowstar 2000 has two analog outputs which may be used to provide outputs to remote displays. The standard digital output may be fed to the computer to provide mathematical functions such as top to bottom flow differential, total oil usage per run, etc. The Flowstar 2000 also has two standard relay contact outputs which may be configured for alarm set points for either high or low flow rates or total. The system has the ability to provide output to an intelligent controller to provide automated flow control. This system provides high accuracy and instantaneous rate and total readouts in a convenient single location. The system, which was installed in a major steel manufacturing facility, accurately monitors oil spray onto the top and bottom of a continuous feed sheet. 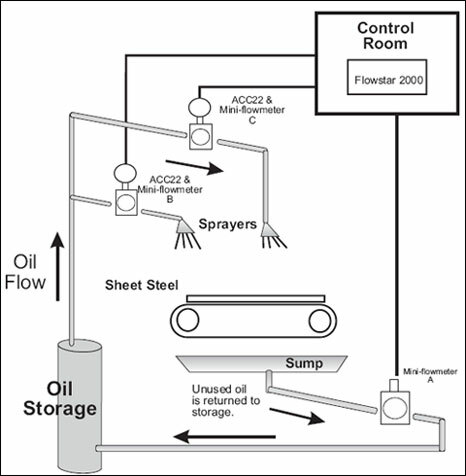 The system also monitors return flow of unused oil to a storage tank and via the Flowstar 2000, provides the user with flow rate and total for three flowmeters. Through the use of the Hoffer flow metering system, the customer’s needs of quality assurance and optimization of oil coating are met.